Secretary Wilson: “This budget changes the way in which we intend to execute battle management command and control." WASHINGTON — In the budget request that was submitted to Congress last week, the U.S. Air Force made investment decisions that just a few years ago would have been jaw-dropping. A $7 billion surveillance aircraft program is being jettisoned in favor of an information network that connects sensors from across the battlefield and in outer space. And billion-dollar satellites known to be engineering marvels are being replaced by simpler, less costly platforms. These are tradeoffs that the Pentagon typically would avoid because they require stepping into unfamiliar territory. But the changes are necessary for the military to ensure air and space supremacy in the future, Air Force leaders said. The budget proposal would take money from hardware and shift it to software. And it would disrupt traditional satellite procurements in favor of faster, more commercial-like approaches to building space systems. 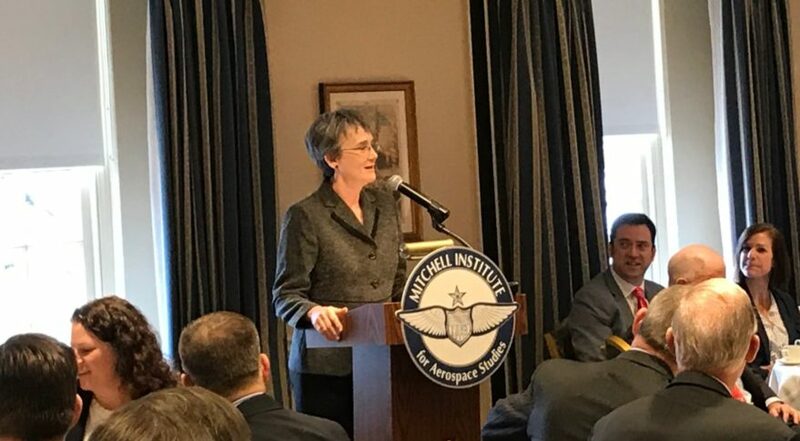 “This budget changes the way in which we intend to execute battle management command and control,” Air Force Secretary Heather Wilson said on Friday at a Mitchell Institute event on Capitol Hill. Rival powers like Russia and China are developing high-speed missiles, advanced ground and space-based surveillance technologies that make Air Force weapon systems — like the airliner-size JSTARS radar surveillance aircraft — easy targets in a conflict. Up until last year, said Wilson, the Air Force had a plan to build a new JSTARS. “It would have been the same concept with better technology,” she said. But a visit in August to a war command center in the Middle East was a wakeup call. Wilson and Air Force Chief of Staff Gen. David Goldfein saw that commanders there were piping in data from dozens of different sensor systems to get a complete picture of the battlefield. Then came an assessment from Air Combat Command that, in a “China or European scenario, JSTARS would not survive,” Wilson said. The proposed alternative is an “advanced battle management system” — an information network that connects sensors from manned and unmanned aircraft, satellites, ships at sea and ground troops. “In a contested environment, an integrated air, space, ground network is more resilient than a single point,” Wilson said. The concept is one the Air Force believes will allow the United States to prevail on future conflicts. But the plan could be politically harder to sell, at least when compared to a shiny new airplane. In another departure from the norm, the Air Force would not hire a prime contractor to integrate the sensors. “That is not our intention,” Wilson said. In its budget request for fiscal year 2019, the Air Force also shifted gears in the procurement of new satellites. One of its largest and costliest constellations is the space-based infrared system, or SBIRS, used to monitor missile launches around the world. The Air Force will stop buying new SBIRS vehicles after the sixth one is completed and instead will shift to a new system of less expensive satellites equipped with “proven sensors,” said Wilson. Large satellites like SBIRS are vulnerable to electronic and kinetic attacks, officials have warned. Smaller spacecraft would be more resilient, said Wilson. “We’ll keep it simple, lighter.” The new satellites would have more room for fuel so they could move to a different orbit or deploy countermeasures if attacked. In space, especially, we have to “move quickly,” said Wilson. The Pentagon’s 2019 budget request includes $9.3 billion for space systems. “A lot of the growth is going into the development and testing of new capabilities to be able to have defendable assets on orbit,” she said. LaPlante is senior vice president and general manager of MITRE National Security Sector, a non-profit research firm that advises the Air Force.